The MAM Bite and Relax Phase 1 is designed to provide teething relief for front teeth. 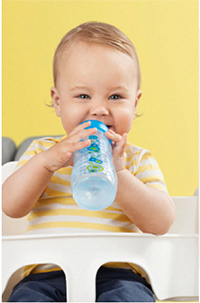 The various textures and chewing surfaces provide instant teething relief and massage tender gums. This teether is extra lightweight and easy to hold and even trains baby's fine motor skills. The clip keeps the Bite and Relax clean and secure. The MAM Bite and Relax Phase 1 is recommended by pediatricians and dentists. MAM Bite & Relax Teethers are available at Target. MAM Bite and Relax Phase 1 Teether with Clip, 2+ Months is rated 4.8 out of 5 by 22. Rated 5 out of 5 by MAMfanmom from Great Teether, Provides Great Relief! My husband picked this out for our son before he was born, and it turned out to be a great item - especially since all he would (and will) take are MAM pacis! Being that it is 'paci-like', it was easy for him to take and he enjoyed chewing on it. The bumps provided extra relief, and the provided clip was a life-saver, lol. I would like to try some bigger MAM teethers for him now, and I intend on using MAM products for our daughter, due in January. Keep up the good work, MAM, as I recommend your products to all my mom friends! Rated 5 out of 5 by Nomo2008 from MAM has the best teethers! We bought this teether when our daughter was 2 months old. She has been teething since day one. This helped so much. Honestly the only teether she would use. She loves it still. She's now 7 months old & has two teeth & MORE coming in. She also has the bite & play teether & LOVES it. She will chew on it then shake it to make it rattle. She can be fussing & you give it to her & she'll just start shaking it. She either has her MAM pacifier in her mouth or her MAM teether. She is definitely a MAM baby!